Rosenberg mentioned the one bright spot was consumer spending was up 2.6%. 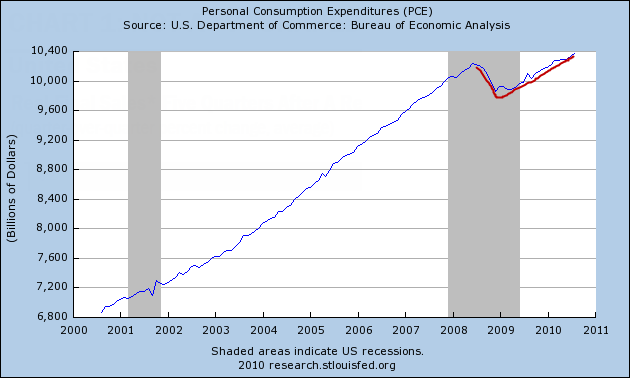 Indeed Table 2 in the BEA report shows Personal Consumption Expenditures were +2.6%. However, it is important to understand what components make up PCE. To understand the discrepancy, we have to know what goes into PCE in comparison vs. retail sales. Here is an interesting article written in August of 2009 that addresses the issue. Is Consumer Spending is 70% of GDP? Economist Michael Mandel's article Consumer Spending is *Not* 70% of GDP not only addresses the above question, he also explains the apparent discrepancy between retail sales and consumer spending. Let's take a look. I opened up this morning’s NYT and see the big headline “Retailers See Slowing Sales in a Key Season.” And I just know that we are about to have another round of “consumer spending is 70% of gross domestic product, so blah blah blah blah of course we can’t recover unless consumers start spending again.” (Not in the NYT story, to their credit, but you can find similar quotes everywhere you look). Blah blah indeed. As a textbook author, there are few things that frost me more than hearing “consumer spending is 70% of gross domestic product,” because it perpetuates two very large and very misleading untruths. Second, an awful lot of those back-to-school dollars are going to imported clothing and school supplies (how many of those laptops and iPods do you think are made in the U.S.?). A dollar of consumer spending does not translate into a dollar of domestic production. In fact, the whole way that the BEA presents the GDP statistics points the public debate in the wrong direction. GDP stands for “gross domestic product”—that is, domestic production. But the breakdown of GDP is into expenditures categories—personal consumption expenditures, government consumption expenditures, etc. I think we need to move towards presenting GDP in terms of production, rather than spending. We need a shift from the consumer to the producer as our main unit of analysis. But for now, we need to stop being so darned obsessed with consumer spending. I disagree with Mandel's last statement because sales tax revenues are extremely important to state budgets. However, Mandel's excellent article helps explain many things even alleged "productivity" issues of the US vs. Europe. 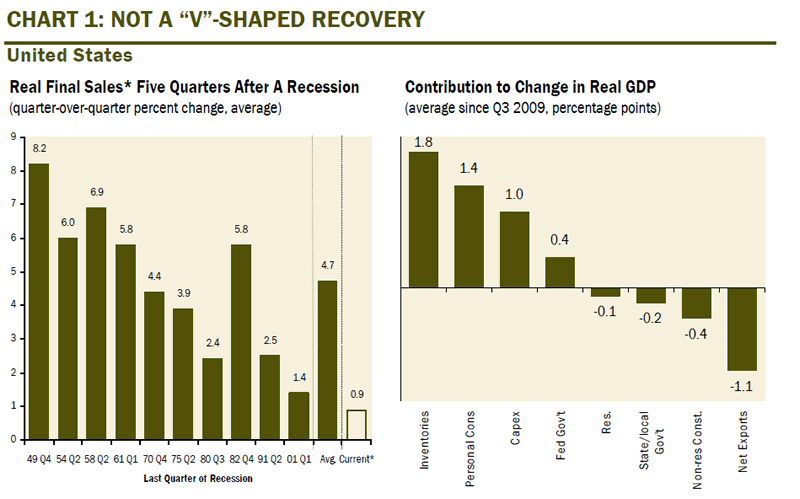 The above chart courtesy of the St. Louis Fed, shows one of the biggest distortions of reality you will ever see. Someone looking at the chart might actually get the idea that "consumer spending" has recovered above pre-recession levels. However, state sales tax revenue (the only valid measure of consumer sales), is still far below 2007 levels and states are in serious trouble over it. So no, consumer spending (in the real sense) is not soaring, and given the need for consumers to deleverage, it would not be a good thing if it were. For more on consumer spending and sales tax collections, please see Retail Sales Rise More Than Forecast; Once Again I Ask "Really?"